Really nice quality, very soft and pleasant to the touch. Is exactly what I was looking for the gym! Our Foutas are handmade 100% in cotton. Fringes are always different, they are the sign of every family of artisans. Cool-Fouta proposes a full range of colors at our stall in Ibiza, please contact us to check availability... Thank you! It all started back in 2011 when a young cooperant, after working for several years on projects of International Cooperation for Development in Tunisia, loses his job as a result of the political process known as "La Revolution du Jasmin" and decides to undertake this venture along with local artisans. Through the relationship with the Tunisian society, it is generated a great passion for craftsmanship and the quality value that the Tunisian Fouta has compared to other fabrics also coming from North Africa or similar hammam towels made in Turkey, India or Egypt. That's how was born the dream of creating a brand only for Tunisian hammam artisanal towels. Foutas full of new colors, while promoting fair working conditions, providing employment opportunities to unemployed young mothers in rural areas in Tunisia, supplying the whole world with a craft that is still part of our Mediterranean roots and culture, providing us with welfare and a great joy to our daily lives. The standard size for our artisanal Hammam Fouta towels is around 2x1m. (78,74x39,37 inches). We also have other sizes available only upon request: doubles 2,50x1,60m., triples 3x2m., kids 1,50x0,75m. and mini 0,60x0,40m. Please feel free to contact me at any time for further details. Foutas are machine washable gaining smoothness in every wash and colors do not fade. We recommend you to do a first washing in machine, separately in a cold water delicate program. Like any other cotton towel, wash your Fouta before you use it to remove any traces of the artisanal production process, also the cotton yarn will become more absorbent. After the 1st washing, use regular cotton program in 30°. In order to remove any stain, you can rub it with bar soap or traditional green soap or Marseille soap, and raise the temperature to 40° for a stronger wash in the machine. In any case, we strongly recommend to get back to the 30º after that. Line drying. Low ironing. Do not use bleach, do not tumble dry and do not dry wash.
Use them as you like, our foutas are very resistant, they are made in 100% natural cotton hand-finished by Tunisian artisans. They are machine washable and their colours do not fade. Foutas will quickly seduce you with their fringes, originality, colors, lightness and multiple uses. What is the difference between the HAMMAM honeycomb and the CLASSIC plain weaving? The honeycomb Fouta is the Tunisian hammam towel original fabric. It is more delicate, so you have to pay a little bit more attention when you use it and while you wash it. On the other hand, this type of weaving is much more comfortable, soft and delicate, becoming a delight in contact with your skin, perfect as a towel or blanket. The more you use it, the more you like it. 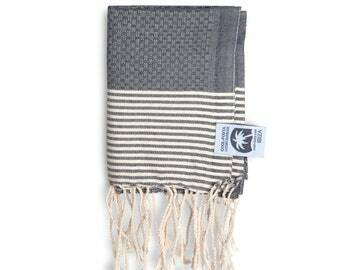 The plain weaving Fouta is a more resistant version for the hammam classic towel. It is like a thin jeans fabric and it can be used in many situations, as pareo sarong towel, home decor, tablecloth or to protect you when you sit on rocks in the mountains, on the beach or at picnics. How can I use my artisanal hammam fouta towel? Classic model Foutas in plain weaving success is due to the fact of durability at the beach or used as traveling towels, also how versatile they become at home as a cover for a sofa-chair-armchair-sunbed or as a fabric for decoration or tablecloth. Honeycomb weaving Foutas are perfect for the hammam, beach, pool, sauna, at your bathroom, or as a yoga blanket, for your sofa or armchair. It is a real pleasure to feel the honeycomb weaving on your skin when you get out of the sea/shower, the same when you are sitting at your desk or hugging your baby with them.